Were pretzels the first Easter eggs? What U.S. city's residents eat the most pretzels? As you're probably already aware, pretzels are a type of baked snack food made from dough. They come in both hard and soft varieties, as well as salty and sweet flavors. Most pretzels have a signature shape that resembles a knot. The pretzel's unique shape is a symmetrical loop created by intertwining the ends of a long strip of dough and then folding them back on each other, forming a “pretzel loop." Legend has it that the pretzel was invented by an Italian monk in the year 610 A.D. To reward young children for learning their prayers, he supposedly folded strips of bread dough to resemble the crossed arms of praying children. He called his creation pretiola, which meant “little rewards." Whether this legend is the true origin of the pretzel, no one knows for sure. Most experts agree, though, that the pretzel does have Christian origins. For example, in the Catholic Church, pretzels held religious significance because of their ingredients. When made with a simple recipe of only flour and water, they could be eaten during Lent, when Christians were forbidden to eat certain foods. Over time, pretzels became associated with both Lent and Easter. In fact, pretzels were often hunted on Easter morning just like many children hunt eggs today. German and Swiss immigrants introduced the pretzel to North America in the 19th century. In 1858, Casper Gloor, a Swiss baker and member of the Swiss Colonization Society, settled in Tell City, Indiana. He soon became famous for his pretzels, which he baked from a secret Swiss recipe. Today, the recipe remains a secret, and Tell City Pretzels still attract pretzel lovers from all over the world. It wasn't until pretzels were introduced to America that hard pretzels came into existence. In 1850, the first commercial hard pretzel bakery opened in Lititz, Pennsylvania. Hard pretzels became popular as a snack food since they were more durable than soft pretzels when kept in an airtight container. In the 20th century, pretzels became very popular in large cities. In particular, the large Italian-American population of Philadelphia made pretzels an integral part of its local cuisine. Today, the average Philadelphia resident eats approximately 12 times more pretzels than the average American. Pennsylvania remains the center of pretzel production in the United States today, making 80 percent of the nation's supply. The U.S. pretzel industry is worth more than $550 million annually, and the average American eats more than 1.5 pounds of pretzels each year. Today, pretzel connoisseurs can enjoy their favorite snack with a wild variety of seasonings, including special glazes, salt crystals, cinnamon, sugar, and various nuts and seeds. Pretzels can also be found in many different shapes, such as sticks, rods, loops, braids, and even letters. Tomorrow’s Wonder of the Day will take you for a ride…for a fee! Ask an adult friend or family member to take you on a field trip to your local grocery store. Head to the snack aisle and check out the pretzel selection. How many different types of pretzels can you find? Choose a couple to take home and enjoy as a snack today! Get your family together to form a pretzel-making team! With just a little yeast, warm water, honey, flour, and salt, you'll be able to use this Easy Pretzel Recipe to make your own homemade pretzels. How do you think the pretzel got its unique shape? Make up your own story that tells the tale of the origin of the pretzel's unique knot shape. You can be as creative as you want to be. Your story can be based upon historical legend, like the explanation given in today's Wonder of the Day, or it can be something completely made up. You decide! Have fun and be sure to share your story with friends and family members. Well, you can always download the Wonder of the Day as a PDF. We hope that helps! That's a tough spot to be in, Bo. We hope you are able to work it out so you keep WONDERing with us! Thanks for sharing your connection, IDC! I didn't know that what country pretzels were made in. There are so many diffrent shapes of pretzels and flavors. I have always enjoyed the taste of pretzels. The dough is different than regular bread. I like that there are now pizzas with pretzel crust!! Hi, I have always loved pretzels, but had no idea why they had that shape! I know now, it got its shape from an Italian monk to reward children for learning their prayers!! He folded strips of dough to resemble the crossed hands of children praying!! Since I'm Catholic I can eat them for lent!! I had no thought of immigrants bringing over pretzels to North America!! German and Swiss brought them over in the 19th century! :) For Easter, kids would look for pretzels instead of eggs! (I would love to do that!) I have a question. Why aren't people sure about the legend of the monk making the pretzels?? Thanks Wonderopolis! Wow! I had no idea what the word pretzel meant. Now, I know. I think it was really cool that it was formed to show kids praying. It told me so much more information than I have ever heard or seen in my life about pretzels. Now I know so much more about PRETZELS! Pretzels are sour but delicious. You now what? I am eating pretzels right now. The shape of most pretzels resembles a what? 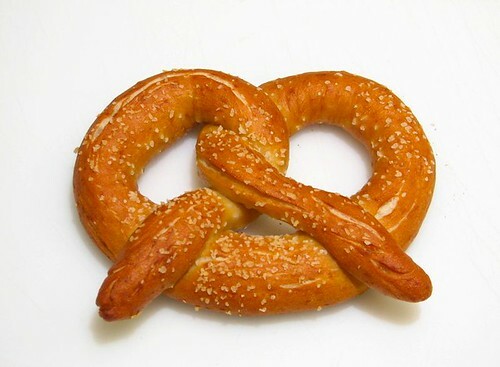 In 1850, the first commercial hard pretzel bakery opened in which state? Which city’s residents eat roughly 12 times more pretzels than the average American? aNew York City Not Quite!